Some consider it to be a glorified re-make of their earlier film The Gay Divorcee (1934), with its familiar story of mistaken identity and a similar cast. The film's witty script, written specifically for Astaire and Rogers, was written by Dwight Taylor (author of The Gay Divorcee) and Allan Scott - and was based on the play The Girl Who Dared, by Alexander Farago and Aladar Laszlo. This film, directed by Mark Sandrich (who directed five of the dance team's films - see * below), was the fourth of nine films that Fred Astaire and Ginger Rogers appeared in for RKO (between 1933 and 1939), although their first film pairing in 1933 was not top-billed and very minor. 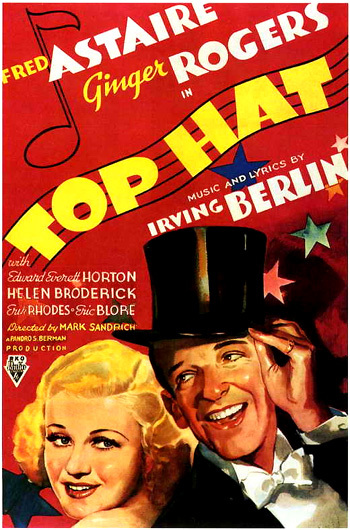 Top Hat became RKO's greatest box-office hit of the 30s (the moneymaker brought in over $3 million). By its second week (in September 1935), it had broken attendance records at New York's Radio City Music Hall by taking in $245,000, and by its third week, it had accumulated $350,000 in ticket sales. It became the second highest-grossing film of the year worldwide behind Mutiny on the Bounty (1935). The film's legendary dances at the pinnacle of Astaire's and Rogers' teaming, with their charm and sophistication, naturally help to develop and carry out the simple plot - the romantic story of two strangers who meet by accident in a hotel in London, and whose budding romance is soon confused by a contrived subplot of mistaken identities. Romantic dance numbers (love duets) help Astaire win the scornful Rogers over to him - (first with "Isn't This a Lovely Day?" in England, and later with "Cheek to Cheek" in Venice, Italy). Filmed during the Depression Era, the film's idea of wealth and glittering elegance is portrayed by the sumptuous backgrounds and gleaming surroundings (fancy hotels, a dream-like, Art Deco Venice with winding canals and bridges, a floating nightclub, etc.) and extravagant costumes of the debonair characters (evening gowns and furs, and tuxedos with top hats and tails). In its own way, the film satirizes stuffy upper-class manners while glorifying in them and providing wish-fulfillment for mid-30's audiences, as painfully demonstrated in the conclusion of Woody Allen's The Purple Rose of Cairo (1985), as a dejected, bereft Cecilia (Mia Farrow) watched the famous "Cheek to Cheek" song-and-dance number from this film, and her face slowly transformed into one of rapt joy - despite being jobless, having been abandoned by a man she left her true love for, and having an abusive, unfaithful spouse. The film was Oscar-less, but was nominated for four Academy Awards: Best Picture, Best Interior Decoration (Carroll Clark and Van Nest Polglase), Best Song ("Cheek to Cheek" with music and lyrics by Irving Berlin), and Best Dance Direction (Hermes Pan with the uncredited assistance of Astaire himself). The film lost the Best Picture honor to Mutiny on the Bounty (1935). The titles and credits begin with an opening sequence depicting a shiny stage floor and the dancing feet of two dancers, shown from the waist down. First Fred Astaire, then Ginger Rogers. After they swirl toward the camera, the picture then dissolves to a shot of a black top hat, over which the remaining credits are superimposed. The top hat belongs to a dignified man who enters a stuffy, but stately London Club - the Thackeray Club (founded 1864), where silence is to be strictly observed. The atmosphere is so quiet and still that the slightest cough and accidental crackling of another gentleman's newspaper disturbs the elderly club members. The rustling newspaper belongs to American Jerry Travers (Fred Astaire), a celebrated Broadway dancer making his London debut the next evening. He is waiting to be picked up by the prissy, high-strung producer of the London dance revue, Horace Hardwick (Edward Everett Horton). When Hardwick, the show-business impresario departs from the club with the high-spirited Travers, the dancer again upsets the club's hushed atmosphere and awakens club members by loudly tap-dancing his exit from the club. Horace: Look here, young fella, I think it's about time you found out for yourself. Jerry: ...No thanks, Horace. In me, you see a youth who is completely on the loose. No yens. No yearnings. No strings. No connections. No ties to my affections. I'm fancy-free. I'm free for anything fancy. No dates that can't be broken. No words that can't be spoken. Especially when I am feeling romance-y. Like a robin upon a tree. Like a sailor that goes to sea. Like an unwritten melody, I'm free, that's me. My decks are cleared for action. Happy-go-lucky, dapper Jerry has another urge and breaks into song, mid-sentence. He sings confidently, in "No Strings (I'm Fancy Free)" that he prefers his present state of footloose independence, and his stringless connections/affections. After singing the verses twice, he exuberantly and noisily practices his tap dancing and jumping, performing airborne heel-kicks, and ultimately slapping and kicking the walls and furniture with both hands and feet. Dale: I dropped up from the room below where I've been trying to get some sleep! Jerry: Oh, I'm sorry. I, uh, I didn't realize I was disturbing you. You see, every once in a while, I...I suddenly find myself - dancing. Dale: Oh, I suppose it's some kind of an affliction. Jerry: Yes, yes, it's an affliction. Uhm, St. Vitus Dance [a disease of the nervous system]. Dale: And it only occurs at this time of night? Jerry: Yes, that's it. It only occurs at this time of night. As a matter of fact, I really shouldn't be left alone. Dale: Yes, I can see that. You probably should have a couple of guards. She isn't very impressed by his confession that has upset her slumber and makes fun of him. As she returns to her room, smiling to herself, Jerry has another dance "attack" coming on in the hallway, hinting that only one thing can stop him - the embracing arms of an attendant nurse. Jerry: I wish you wouldn't leave. Jerry: I think I feel an attack coming on. (He starts dancing in the hallway). See, there it is. Jerry: There's only one thing that'll stop me. Dale: Oh, you must tell me what it is! Jerry: My nurses always put their arms around me. (She rolls her eyes) Well, I'll call the house detective and tell him to put his arms around you. Jerry describes to Horace the 'complaint' that he has just seen: "I've just seen the complaint and she's lovely, she's delightful, she's charming, and she wants to sleep." He softens the noise of his dancing by appointing himself "official sand man" and sprinkling sand from the hallway cuspidor on the hotel suite's floor. To lull her to sleep, he proceeds to gently perform a soft-shoe dance on the fine sand and tenderly caress and pat the floor during his sand dance. One floor below, Dale snuggles back to sleep in her bed. The sand dance is quite effective - Dale and Horton both fall asleep. Jerry winds up yawning and collapsing into a chair himself. The next day, courting Dale Tremont, he purchases most of the flowers in the hotel flower shop and sends them to her - with a card reading: "From your silent admirer." He asks that they be charged to Horace Hardwick, Room 404. After Jerry leaves, the flower salesman wonders to his assistant (Lucille Ball in an early role) about how Miss Tremont's Italian dress designer Alberto Beddini (Erik Rhodes) will react: "I wonder what Mr. Beddini is going to say about this...The desk clerk has intimated that Mr. Beddini provides Miss Tremont with all the niceties. Including her clothes...And her niceties are very nice." When Jerry finds Dale dressed in riding clothes in the hotel lobby, he offers to take her to the Belcher Riding Academy stables, but she declines. He surreptitiously takes the place of the hansom cab driver in the cab waiting outside. She discovers that he is the driver when he cannot control his irrepressible, tapping feet in the driver's seat (keeping rhythm with the sound of the horse's hoofs on the street), heard through the roof of the cab. Dale spots him through the cab's trap door. Jerry provides her with a thought about the similarity between his uncontrollable horse and other girls: "In dealing with a girl or horse, one just lets nature take its course." Only slightly amused by his behavior and his "strange power over horses" when they arrive at the academy, she tips him with a coin, suggesting: "Buy yourself a new hat." Jerry: A charming little spot you have here. When does the concert start? Dale: Just as soon as you and the rain stop. Jerry: Aw now, please, you wouldn't like to be just a little bit more friendly, would you? Dale: Why should I? I don't know you from Adam. Jerry: Maybe it's the way I'm dressed. When a clumsy cloud from here meets a fluffy little cloud from there, he billows towards her. She scurries away, and he scuds right up to her. She cries a little, and there you have your shower. He comforts her. They spark. That's the lightning. They kiss. Thunder! First, he sings "Isn't This a Lovely Day?" to break down her haughty defenses and change her mood. Although she listens attentively, her back is turned to him through most of the song. It's a lovely day and everything's OK.
Then, after the song ends, he walks slowly away toward the middle of the bandstand gazebo, strolling and casually whistling. At the start of a two and a half minute flirtatious dance number in which he cleverly challenges her to join him, she also whistles, stands and then pursues him, imitating his steps and dance gestures exactly. They perform a wonderful dance together to express the progression of their emotional involvement (from acquaintance through courtship and romance), beginning first with her mimicking his steps. He challenges her with a dance step which she accepts and then repeats. Soon, she adds an original variation of her own to top him and presents it to him, to his delight and surprise. As the dance progresses, they are cooperating fully with each other, dancing in unison, side by side. Facing toward each other, they almost touch and fall into each other's arms, but refrain from doing so. The tempo of the music accelerates, as they mirror each other's steps while facing each other, performing swinging motions with their arms. Frolicking and tap-spinning together, again side by side, they become more and more playful with each other, not just imitating each other but performing for each other. A loud, crackling thunderclap causes them to freeze and look at each other. Then the music and the tempo of their dancing accelerates again, as they make backward dragging steps while facing each other. They take a leap while turning, and finish the turn with a tap dance barrage, in unison. And then for the first time, she opens her arms and invites him to touch and take her in an exuberant embrace - they spin and whirl joyously around the stage floor together. After a series of stops and starts, performed in unison, they cooperate and imitate each other - he throws her and then she throws him. At the end of their marvelous dance sequence, they dance off the front of the bandstand, realizing that it's raining, sit back cross-legged and perch on the edge of the bandstand, smiling and shaking hands in the final fadeout.